Reading books together helps babies create a foundation for lifelong learning by building skills that fluent readers take for granted. Babies have to learn that there are patterns in the sounds they hear, and that these sounds make words. They have to learn that the squiggly lines in books are letters and those letters make words. They also have to learn that there is a connection between those letters they see and the sounds they hear. That’s a lot of work for a baby! However, this connection, called print awareness, is one of the most basic pre-literacy skills and is absolutely necessary before a child can learn to read. All About Learning Press describes print awareness as “the understanding that words on a page have meaning and that they are related to spoken language,” further explaining that “As children develop print awareness, however, they begin to realize that those characters on the page are words, and that words are read in lines from left to right and lines are read from top to bottom. They learn that there are spaces between words and punctuation at the end of sentences.” Once children learn what text looks like, they are better able to recognize it in different contexts. They will be able to recognize that there are words all around them, not just on the pages of a book, but also on signs, billboards, cereal boxes, shampoo bottles, and more! 1. Start at the beginning. Reading Rockets suggests that you begin reading aloud by looking at the front cover and reading the names of the author and illustrator. You can also talk about the front and back of the book, and about reading from left to right. Hold up the book and say, “This is the front of the book, (turn it sideways and state) and this is the spine.” Turn the book to the back cover and state, “This is the back of the book.” Then ask, “Do we begin reading from the front or the back of the book?” (Students should respond, “From the front.”). 2. Point to the text as you are reading. This will help distinguish that you are reading the words rather than just interpreting the pictures. 3. Talk about words you see during daily activities. Words are everywhere, and so are learning opportunities! This video has some great examples of finding words in daily activities. Mira’s mother doesn’t just point to the sign and read “melons” she also makes the connection between two M words: M for Mira and M for melon! 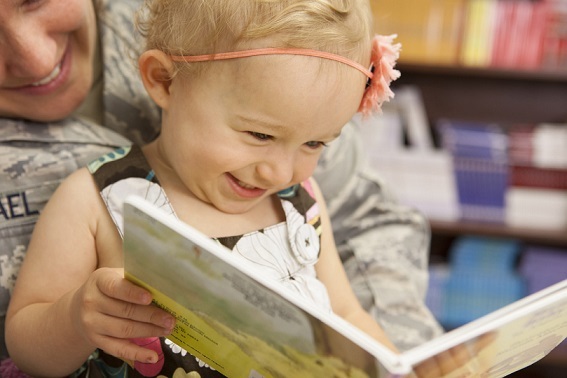 Read aloud every day starting at birth builds babies’ brains so that when they start kindergarten, they are ready to learn and can become strong readers. Reach Out and Read Kansas City incorporates books into pediatric care for babies ages 0-5, encouraging families to read together. This allows children gain pre-literacy skills like print awareness. To learn more about our program, visit our website. To help further our mission, consider donating to our cause.